Salmon is one of the best types of fish to eat. Nutritionally dense, it’s packed with protein, vitamins and minerals. Most notably it is high in omega-3 fatty acids which the body cannot make itself. The only way to get Omega 3 fatty acids is through your diet which is important as they contribute to healthy brain functions, heart, eye and joint health. 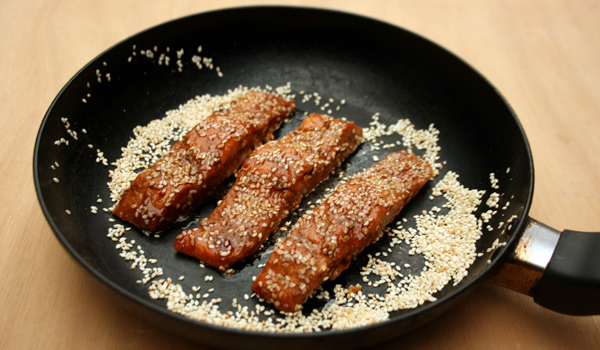 Hot and straight from the oven or hours later and cold, this baked sesame soy salmon recipe is one of our favorite ways to enjoy this nutrient packed fish. Combine ginger, sesame oil, soy sauce, honey, lemon juice, chilli and salt in a medium bowl. Place fillets in a Ziploc bag and pour half of the sauce into the bag to coat the salmon fillets. Reserve the remaining sauce for later. Let the salmon marinade in the fridge for at least 30 minutes. Preheat the oven to 180°C and place the marinated salmon fillets in a baking dish, skin side down. Bake for 10 minutes, remove the salmon from the oven and brush the fillets with the remaining sauce. Sprinkle the toasted sesame seeds on the top of the salmon fillets and return the salmon to the oven. Increase the oven to 220°C and cook for another 7 minutes.